These days, many riders are blessed with access to an all-weather schooling arena, meaning that they can train and exercise their horses all year round, regardless of the weather. 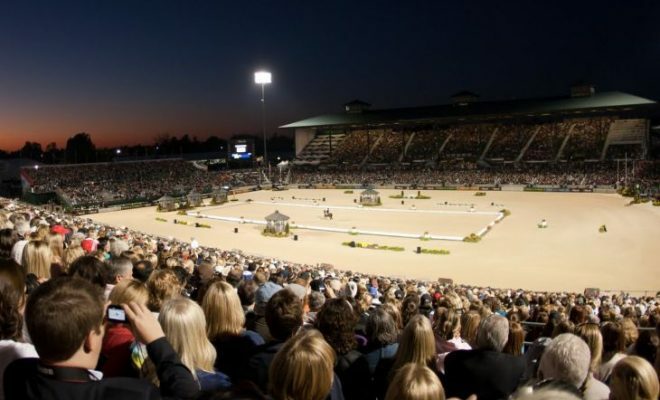 Older dressage competitors will remember the “good old days” when all dressage tests, including Grand Prix, were ridden on grass, and most people schooled their horses in a makeshift arena set up in the flattest corner of a field. Back then, the dressage season ran alongside the horse trials season, from late spring until the early autumn when the ground was suitable. Now, with the advent of all-weather surfaces, schooling and competing takes place for 12 months of the year with no seasonal break. So, unless you are an event rider or you compete regularly at riding club events, you will rarely need to ride a test on grass. Riding a good dressage test on grass is an art in itself! Here are some top tips on how to produce your best work on an unfamiliar surface, should the need arise. You can’t expect your horse to suddenly adapt from working on an artificial surface to performing on grass. So, in good time before your competition, you’ll need to practice at home. Before attempting to negotiate the movements of the test, it’s a good idea to practice riding your horse freestyle on grass. That will give you chance to get used to how different he feels. Although there’s no guarantee that the competition arena will be completely flat, try to choose the flattest area of your field or paddock for your rehearsal space. Measure out a 20m x 40m or 20m x 60m arena, using a proper dressage arena tape measure so that the dimensions are accurate. If you don’t have a set of dressage boards, improvise by using evenly-spaced jump poles or pieces of plastic guttering to mark the outline of the arena. You could use cones for the arena letters or splash out and buy yourself a set of plastic dressage markers. Your arena measuring tape will show you where each letter should be placed. Avoid using a hedge or fence to form one side of the arena. You probably won’t have this luxury in a competition, and you don’t want your horse to become accustomed to having a natural barrier to “lean” on for support. Before you begin, walk your new arena to make sure there are no rabbit holes or big rocks hidden in the grass that could pose a danger to your horse. Unlike an artificial arena, grass is a living entity! Grass can be mossy and spongy, thin over rock- hard ground, or patchy with good areas interrupted by soggy, wet patches. A grass arena is rarely perfectly flat and even! For that reason, it’s important to practice riding on grass in all conditions. That way, you’ll be prepared for anything you encounter on the day of the competition. To help your horse to cope with potentially slippery conditions, it’s sensible to have him shod with stud holes behind before the competition. Invest in a selection of studs of different sizes and practice using them at home. Your horse will need to learn to stand still while you put the studs in and also when you take them out. If you don’t practice this, you could end up in a panic on the day if you can’t persuade your horse to cooperate. Never travel your horse while he has studs fitted. He could injure himself and your flooring will end up shredded! In general, when you ride your horse on an artificial surface, he will move “through” the surface, rather than over the top of it, and some surfaces are deeper and slower than others. In contrast, when you ride on grass, your horse will move over the top of it. That means you may feel that you’re moving much more quickly than you usually do. Also, you might feel that your horse’s steps are not as soft and springy without the benefit of a good surface under his feet. Transitions and turns may feel less balanced than usual, especially if you’re working on grass that is short and slick with water after a shower or that has dew on it. Unless the field is bowling-green smooth, there will be tussocks of grass and divots left by previous horses’ feet, and your horse may catch a toe from time-to-time. So, how do you cope with this less-than-perfect situation? First, don’t stop riding forwards into the contact. That’s the only way you’ll keep your horse connected and in balance. And balance is crucial in a grass arena, especially if it slopes. Use plenty of half-halts to set your horse up for each transition, turn, and change of direction. That will help to keep him engaged and balanced, and will also protect and preserve the all-important rhythm. Be very careful that you don’t tip forwards, which often happens when riders are nervous and go into self-preservation mode. Keep your shoulders back, your hips forward, and your legs wrapped securely around your horse’s sides (without gripping up with your knees). Don’t look down at the ground; look up and forwards. Make sure that you ride the corners as deep as is comfortable for your horse’s level of training. That’s important, as it enables you to maximize all the arena space available to you, helping your horse to cope with the unfamiliar surface and keep his balance. If the surface is slippery, allow your horse more time for turns and transitions. Preparation is the key here! Riding a dressage test on grass is a different experience to riding on an artificial surface. Prepare your horse by practicing at home for a couple of weeks before the competition. When riding on grass, balance is often the first thing to suffer. Be sure to use plenty of leg and have your horse connected between your leg and hand to keep his hind legs engaged and underneath him. Use plenty of half-halts to keep the engagement, and allow yourself more time to set your horse up for each transition and change of direction. And don’t forget to fit your horse with studs, especially if the grass is wet! Do you regularly ride dressage tests on grass? If so, what’s your secret to a perfect performance? Share your tips and experience with us in the comments section below!